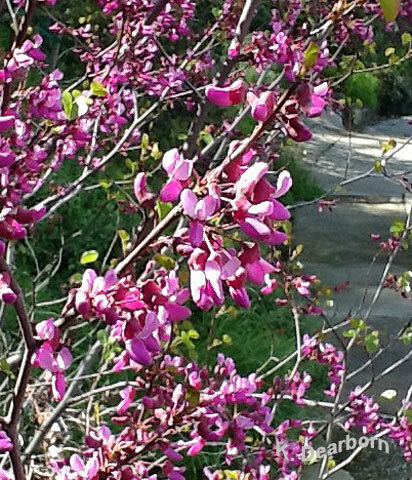 This western redbud (Cercis occidentalis) is blooming in our north-facing front yard. Our success with native plants has been sporadic. 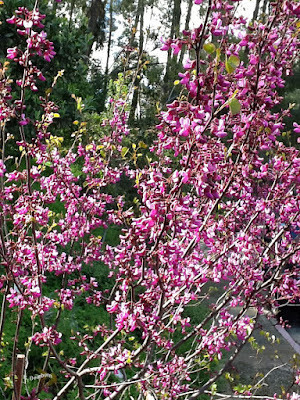 Planting this redbud was part of a long-term plan to replace an ornamental plum tree that was declining. We loved the spring blooms, but the increasing summer heat in the San Fernando Valley had become too intense for the plum. 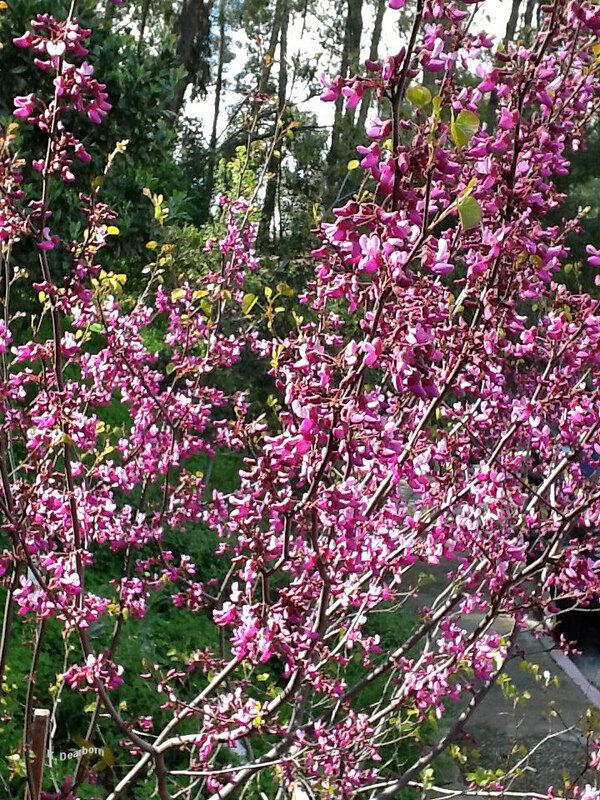 Five years ago I planted a 5 gallon redbud in the dappled shade of the older tree. 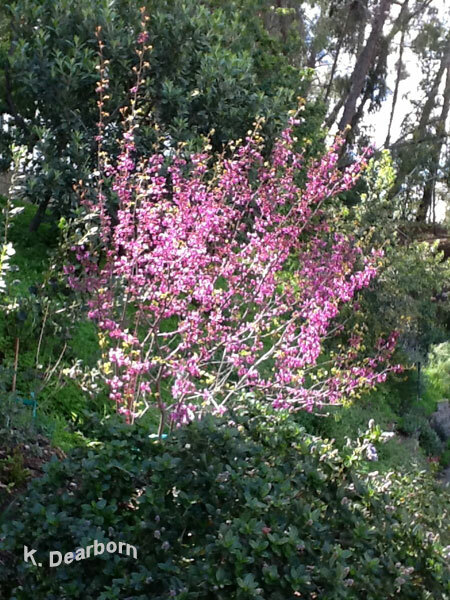 Gradually the plum was thinned to provide the redbud with more light. I wasn't sure that the plan was working. The redbud was still small and didn't flower much. Just over a year ago, the plum became precarious. We were sad to see the old tree go, but it was dying and riddled with termites. The tree trimmers carefully removed the old tree without harming the four-foot redbud. Over the summer and fall, the redbud grew several feet and really came into its own. With the winter rains, it has burst into brilliant purpley blooms. The redbud hasn't completely filled into the spot in the yard vacated by the ornamental plum, but it will. Finally, a real native plant success. 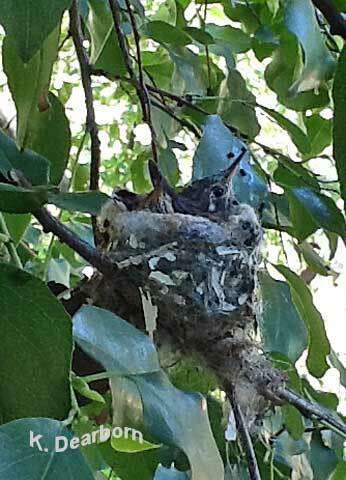 This nest of Allen's hummingbirds are nearly ready to fledge. These two little guys should take their first flights in the next 3-5 days. It is hard for Cornell University to imagine, but this is our third nest of Allen's hummingbirds this 2019 season. (We enter data on our nesting birds in Cornell's NestWatch data base.) The first eggs were laid in a poorly placed nest in early January. That nest was completely soaked in a rain storm and failed. The second nest was established by a more experienced female and she was able to raise one chick to fledge on March 9th. The second egg never hatched. A record cold February may have played a role. Another chick in a fourth nest hatched on March 16th, its sibling should hatch sometime today. All of these Allen's hummingbird nests are in native hollyleaf cherry shrubs. The plant is slow growing. It's wide leaves are waxy to survive in hot dry summer temperatures and therefore provide protection when it does rain. 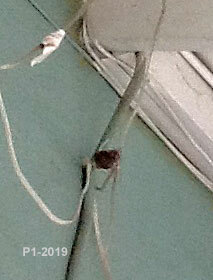 The first female, however, has taken a bold step and built her second nest under the protection of the patio. 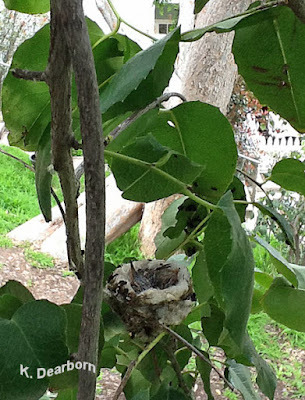 Anna's hummingbirds build nests on man-made objects fairly frequently. It is rather unusual for our Allen's hummingbirds. She has two eggs in her new nest. This location should be protected from wind, rain, and even most predators. The biggest issue may be that when chicks first start to flap their wings, they won't have neighboring branches to flutter to. They won't be able to sidestep back to the nest. The location is also about 20 ft off the ground. 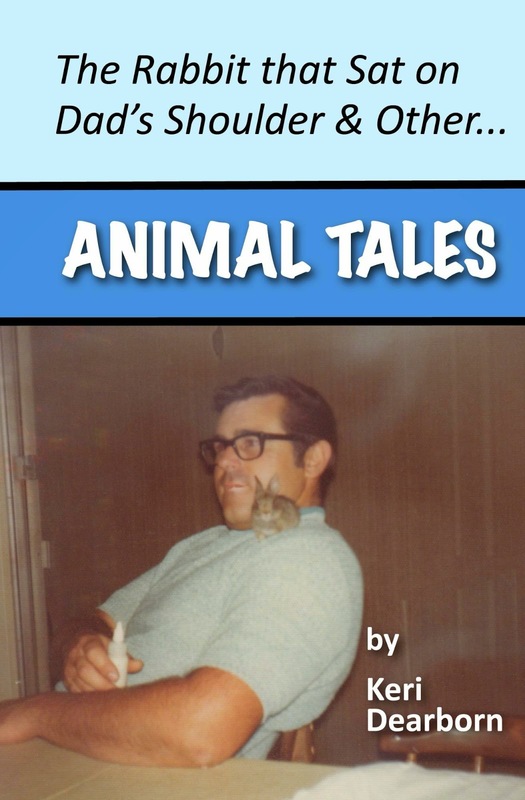 That is a long way for a curious youngster to fall. Unexpected fluctuations in weather can cause nests to fail. 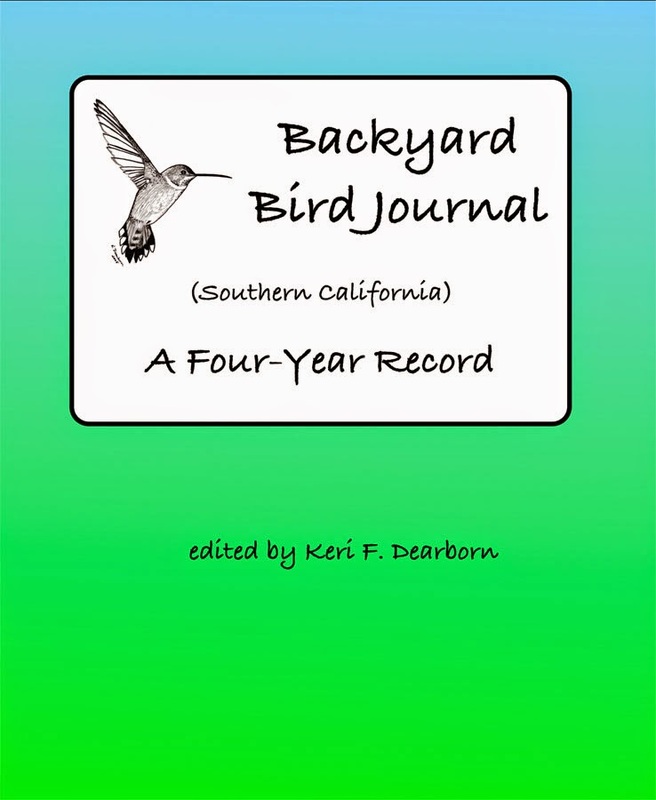 Strong wind, pounding rain, cold snaps, can all take a toll on young hummingbirds. A rain storm is expected on Wednesday. Hopefully it will be lite. A heavy rain could make the first days of flying and survival without the protection of the nest a challenge for these youngsters. They are back! Thousands of painted lady butterflies migrating overhead. Right now 72 butterflies a minute are passing over our house and down into the San Fernando Valley. Isn't that amazing! In an hour that will be more than 4,200 butterflies! The winter rains have created the perfect conditions for masses of these medium-sized butterflies to take to the air. Where are they coming from? Probably somewhere near the California-Mexico border or down in Mexico. Where are they going? They are headed in a northwest direction. When this happened in 2012, scientists were trying to follow the painted ladies to see where they went. Michael tells me that they are going to Oregon. What a long way for these butterflies to travel. Go outside look up or 10-20 feet off the ground. It is a fantastic natural phenomenon, a mass migration of butterflies. Go take a look, who knows when or if it will happen again.